Today we will be looking at one of the earliest dinosaurs. Enter Herrerasaurus ischigualastensis! Herrerasaurus lived in what is now Argentina, in South America, during the Triassic Period, roughly 231 million years ago. The largest specimen on record would have been about twenty feet long from snout to tail, but all adults may not have reached this size, possibly averaging out at around fifteen feet. When alive Herrerasaurus would have eaten meat, according to its teeth. The genus name translates to "Herrera's Reptile", in honor of the goat herder who discovered the first bones of this dinosaur, Victorino Herrera. 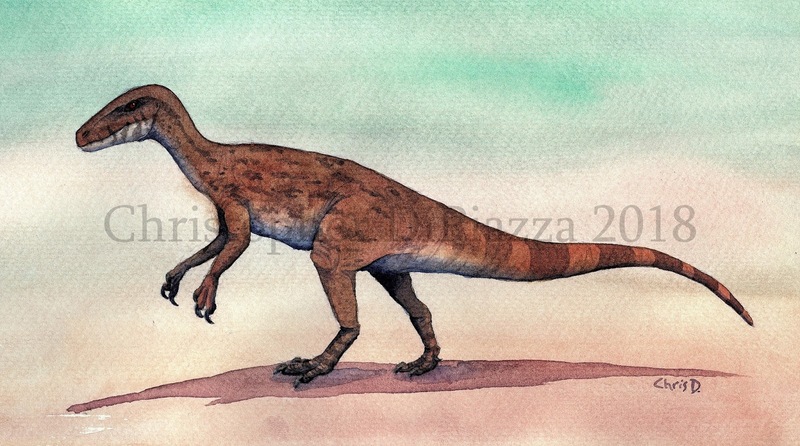 My Herrerasaurus ischigualastensis life reconstruction in watercolors. Herrerasaurus had a boxy profile to its skull, which was armed with a lower jaw that was able to flex back and fourth. This is an unusual adaptation for dinosaurs, but is common in many modern lizards, like monitors, to help manipulate large chunks of food to the back of the mouth to be swallowed. (lizards evolved this trait independently of Herrerasaurus, however.) Herrerasaurus was also armed with extremely long, dagger-like teeth, that curved towards the back of the mouth, another quality of a meat-eater. Cast of the first discovered Herrerasaurus skull on display at the Academy of Natural Science in Pennsylvania. Herrerasaurus had strong arms, each armed with three curved claws. It had proportionally short thighs, and long lower legs and feet, suggesting it was a fast runner in life. It's tail was not very flexible because of the bony structures in its vertebrae, which is also a characteristic of dinosaurs that were good runners, to aid in maneuverability. Herrerasaurus had a number of odd characteristics about its anatomy that have caused scientists to dispute over what kind of animal it really was. It walked in a fully erect posture, like all dinosaurs, but the socket where its femurs attached to its pelvis was not as open, or "window-like", as it is with later dinosaurs. It also only had two vertebrae over its hips, called sacral vertebrae, whereas most dinosaurs typically have three. Lastly the bone int its hip, called a pubis, was angled behind the body, which is typical in ornithiscian dinosaurs, dromaeosaurs, and birds, the last two wouldn't evolve until millions of years after Herrerasaurus. Herrerasaurus mounted skeleton on display at the Field Museum in Chicago. Herrerasaurus is one of those fossil creatures that has gone through a few identity crises over the years since its discovery. Because it lived so early on in the Mesozoic, before dinosaurs started truly diversifying, it has proven tricky to place, genetically. At first, because of its teeth and long legs, it was classified as a very early theropod. However, some suggested it had more in common with early sauropodomorphs, like Plateosaurus. Some have suggested that Herrerasaurus, despite its meat-eating qualities, was actually closest to ornithischian dinosaurs, because of its backwards-facing pubis bone. 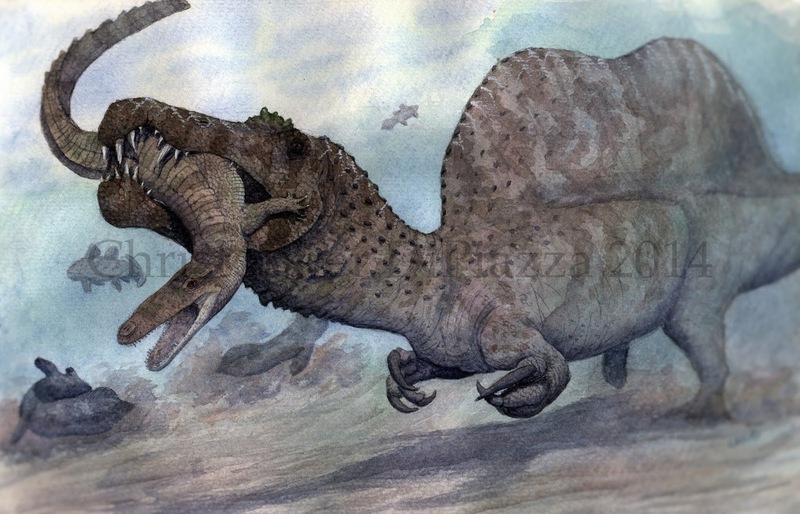 It was even proposed to be not a dinosaur, at all, placed just outside the dinosaur family tree and classified as something more closely related to crocodiles due to more basal traits in its skull and hips. However, as more and more fossils from the Triassic are being unearthed, the latest analysis of Herrerasaurus places it back as a dinosaur, almost at the very base of the dinosaur line, as a kind of very early saurischian dinosaur. Benedetto, J.L. (1973). "Herrerasauridae, nueva familia de saurisquios triasicos" (PDF). Ameghiniana. 10 (1): 89–102. Bittencourt, J.S. ; Arcucci, A.B. ; Marsicano, C.A. ; Langer, M.C. (2014). "Osteology of the Middle Triassic archosaur Lewisuchus admixtus Romer (Chan~ares Formation, Argentina), its inclusivity, and relationships amongst early dinosauromorphs". Journal of Systematic Palaeontology. 0 (3): 1–31. Gauthier, J.A. ; Nesbitt, S.J. ; Schachner, E.R. ; Bever, G.S. ; Joyce, W.G. (2011). "The bipedal stem crocodilian Poposaurus gracilis: inferring function in fossils and innovation in archosaur locomotion" (PDF). Bulletin of the Peabody Museum of Natural History. 52 (1): 107–126. doi:10.3374/014.052.0102. Archived from the original (PDF) on 2015-09-24. Gilmore, Charles W. (1920). 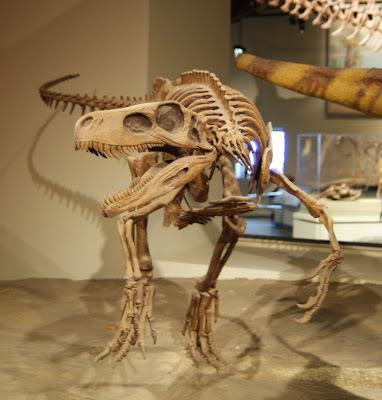 "Osteology of the carnivorous dinosauria in the United States National Museum, with special reference to the genera Antrodemus (Allosaurus) and Ceratosaurus". Bulletin of the United States National Museum. 110 (110): 1–159. Nesbitt, S. J.; Smith, N. D.; Irmis, R. B.; Turner, A. H.; Downs, A. & Norell, M. A. (2009). "A complete skeleton of a Late Triassic saurischian and the early evolution of dinosaurs". Science. 326 (5959): 1530–1533. Novas (1993). "New information on the systematics and postcranial skeleton of Herrerasaurus ischigualastensis (Theropoda: Herrerasauridae) from the Ischigualasto Formation (Upper Triassic) of Argentina". Journal of Vertebrate Paleontology. 13: 400–423. Novas, F.E. (1994). "New information on the systematics and postcranial skeleton of Herrerasaurus ischigualastensis (Theropoda: Herrerasauridae) from the Ischigualasto Formation (Upper Triassic) of Argentina". Journal of Vertebrate Paleontology. 34 (4): 400–423. Padian, K.; May, C.L. (1993). "The Earliest Dinosaurs". In Lucas, Spencer G.; Morales, M. The Nonmarine Triassic. New Mexico Museum of Natural History & Science Bulletin. 3. pp. 379–381. Sereno, P.C. ; Novas, F.E. (1993). 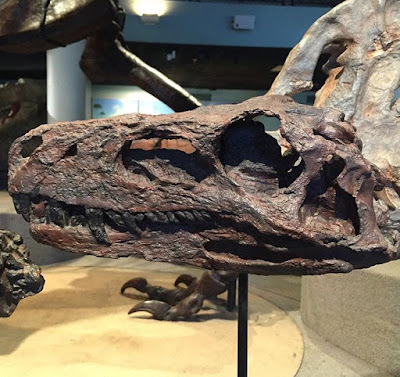 "The skull and neck of the basal theropod Herrerasaurus ischigualastensis". Journal of Vertebrate Paleontology. 13 (4): 451–476. Let's Publish The Old Kingdom! Cretaceous North Africa, home to the largest meat-eating dinosaur known to science, Spinosaurus, was a fascinating environment from which we have a wealth of fossils and information from. Despite this, never before has there been a textbook strictly dedicated to this fascinating time and place in earth's history. That is before paleontologist, Jamle Ijouiher, decided to compile all his research on this subject into one amazing textbook for anyone to buy and own in his/her own collection of reading material! My Spinosuarus aegyptiacus is one of the illustrations featured in Jamle's upcoming book, The Old Kingdom. Click the link below to donate and ensure it gets published! Because of this, Jamale needs our help to get this book through the last stages of publication. Check out this link and read more about his mission to get his book published and contribute a donation if you can! It will be helping paleoartists, like myself, scientists, like Jamale, and take us one step in the right direction of having good scientific material available for anyone who wants it. Today we will be looking at the most iconic pterosaur of all. Check out Pteranodon longiceps! Pteranodon was a large pterosaur (prehistoric flying reptile that was not a dinosaur.) that lived in what is now central United States, including Kansas, Alabama, Nebraska, Wyoming, and South Dakota, during the Late Cretaceous Period, between 86 and 84.5 million years ago. The biggest Pteranodons on record have wingspans of over twenty feet from tip to tip, but average males were more close to eighteen feet and the females (Yes, we are pretty sure we can tell the two sexes. More on that later.) were a bit smaller, with about a twelve foot wingspan. When alive Pteranodon would have been a meat-eater, feeding on fish and other marine prey that lived in the shallow sea that once covered the region of the the country that Pteranodon would have flown over in life. The genus name, Pteranodon, translates to "Toothless Wing" because...wait for it...it didn't have any teeth and it had wings. Ironically there are way too many pop culture representations of this animal that have teeth! 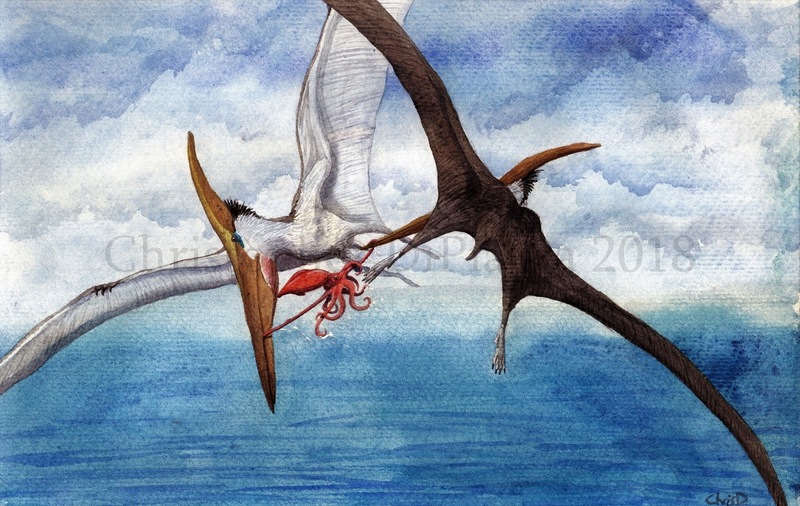 Two male Pteranodon longiceps fight over a cephalopod. Reconstruction by me in watercolors. Pteranodon is a very well-studied animal, known from over one thousand fossil specimens! Among these individuals we find two body types. One type is the most iconic vision of this animal, being the larger of the two, with an average wingspan of eighteen feet (but some are larger as stated above) with a long, pointed crest growing out of the back of the skull. The second body type is much smaller, with only a twelve-foot wingspan. (Still huge if you consider the largest flying animal today, the Wandering Albatross, has a wingspan just under that.) These smaller individuals also had a short, blunt crest behind the head and wide hips, even wider when compared to their in every other way larger crested counterparts. At first it may seem there were two species of related pterosaurs sharing the same environment, but upon closer inspection, the evidence is pointing to one species that was sexually dimorphic. (sexual dimorphism- when the males and females of a species look different.) The the larger, crested type was the male, and the smaller, short-crested, was the female. Why do we think these two forms were different sexes of the same species and not simply two different species? Let's look at the three key differences between them I listed above. Skeletal mount of a female (probably) Pteranodon hanging from the gift shop ceiling of the American Museum of Natural History in New York. This isn't actually an indicator of sexual dimorphism by itself. This is because within reptiles, there are many examples of female-larger and male-larger species across the board. Sometimes even within the same genus of reptile there are variations with male and female size dimorphism. So that one is out as far as evidence goes. Let's look at the other two clues. In almost all animals that use display structures like colors, frills, horns, manes, or crests as a difference between the sexes, the males are the ones that have more going on. Don't misunderstand me here! There are plenty of species where both the males AND females have cool structures...it's just in the ones that there is a difference between the two, the males are the ones with the more visually intense bits to show potential mates how healthy they are. It's more biologically taxing to be the female, carrying and giving birth, so males are often the ones competing for their attention, instead of the other way around. If these two forms were opposite sexes, the ones with the long crests would more likely be the males. This is the strongest piece of evidence. The smaller individuals with short crests had wider hips. Wider hips are found in females of almost any species of vertebrate for giving birth. In this case, wider hips would make it easier for those individuals to carry and lay eggs. The fact that they are specifically wider than those of the other body type that is larger in every other way, including a cool display crest, strongly suggests we are looking at males and females of the same species. Sketch I did in graphite of a female (probably) Pteranodon longiceps. Beyond being one of the few fossil species we can pretty confidently distinguish the males from the females in, Pteranodon had a number of other cool things going on with its anatomy. Let's start with that beak. It was huge! In fact, Pteranodon's skull is much longer than the rest of its body! A beak like that, combined with the evidence that this animal spent much of its life soaring over the sea, would have been excellent for snatching up fish and other small marine prey. Pteranodon may have even dove for its food, using its beak like a spear to catch prey even deeper under the water's surface. Having a long beak is a helpful adaptation for a predator hunting prey in the water because it greatly extends the striking range without having to move the whole body much. To further support the idea it was a fish-eater, fish bone and scale fossils have been found in the stomach cavities of Pteranodon specimens. 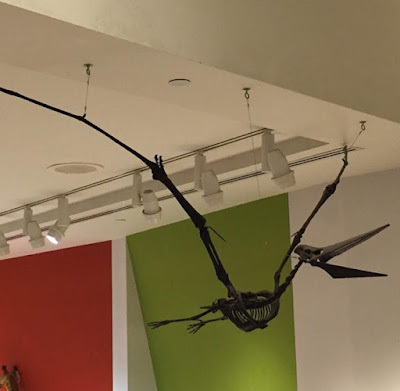 Pteranodon mount on display at the American Museum of Natural History in New York. Pteranodon had particularly long wings, even for a pterosaur, because it was adapted for soaring long distances. We can see parallels in flying animals, like birds, today. Birds that live most of their lives soaring over the ocean, like albatross, have long, tapered, wings, as well. Like them, it is likely Pteranodon was capable of going long distances without flapping. It may have even been able to sleep while flying! 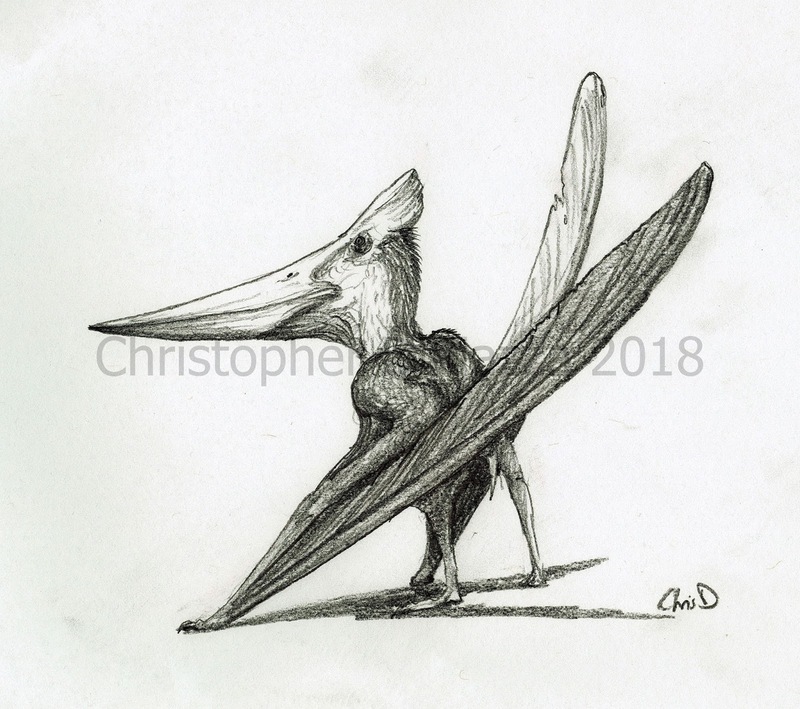 (although we don't have direct proof of that) That being said, the arm bones of Pteranodon suggest it had HUGE muscles there in life, so flapping wouldn't have been a problem for this pterosaur, either, if i t needed to do so. Pteranodon longiceps male (probably) skeleton hanging in the American Museum of Natural History's temporary pterosaurs exhibit. Since all the Pteranodon fossils on record were unearthed in an area that would have been a sea during the times of their deaths, we can logically assume Pteranodon spent most of its time flying over water, probably resting and nesting on islands or rocky cliffs surrounded by, or near the water. While Pteranodon, itself, was an adept predator, it had to watch out when it got near or in the water for the gigantic sea monsters it shared its world with. Most notable was the mosasaur, Tylosaurus. Lastly, please don't refer to Pteranodon as "pterodactyl". 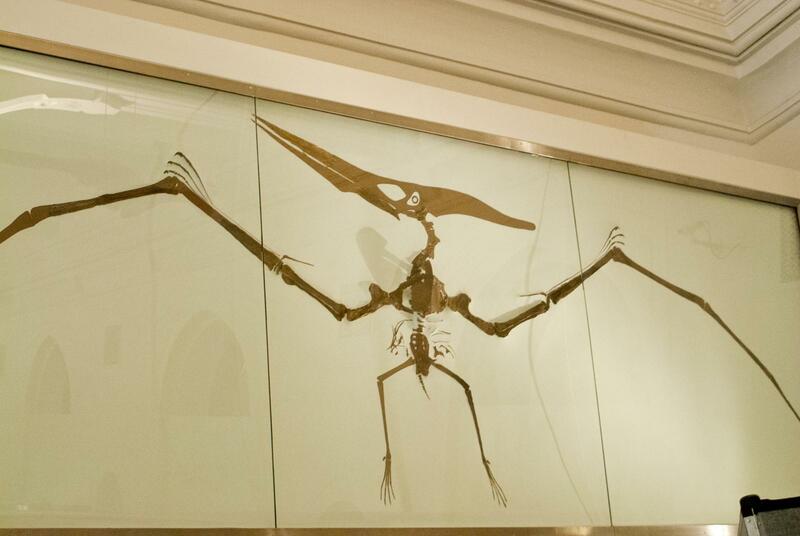 Too often are pop culture depictions of pterosaurs labelled as "pterodactyl", but are clearly based on Pteranodon. Seriously, if you say "pterodactyl" that in front of a paleontologist, he or she will no doubt correct you with a pleasant smile, but I promise you that poor scientist is screaming inside. Bennett, S.C. (1992). "Sexual dimorphism of Pteranodon and other pterosaurs, with comments on cranial crests". Journal of Vertebrate Paleontology. 12 (4): 422–434. Bennett, S.C. (1994). "The Pterosaurs of the Niobrara Chalk". The Earth Scientist. 11 (1): 22–25. Bennett, S.C. (2000). "Inferring stratigraphic position of fossil vertebrates from the Niobrara Chalk of western Kansas." Current Research in Earth Sciences: Kansas Geological Survey Bulletin, 244(Part 1): 26 pp. T omkins, J. L.; Lebas, N. R.; Witton, M. P.; Martill, D. M.; Humphries, S. (2010). "Positive Allometry and the Prehistory of Sexual Selection". The American Naturalist. 176 (2): 141–148. Witton, M.P. ; Habib, M.B. (2010). "On the Size and Flight Diversity of Giant Pterosaurs, the Use of Birds as Pterosaur Analogues and Comments on Pterosaur Flightlessness". PLoS ONE. 5 (11): e13982. It is time for Prehistoric Beast of the Week's second installment of Safari Ltd dinosaur toy review! This time we will check out Safrari's rendition of Pachyrhinosaurus, which they generously sent to me to review for you all. Pachyrhinosaurs was a ceratopsian dinosaur, in the same general group that includes the most famous Triceratops, that lived during the Late Cretaceous in what is now North America. There are currently three named species, all from North America. One of these species, the youngest one, Pachyrhinosaursu perotorum, is known from remains found in Alaska! Pachyrhinosaurus has gained popularity in the mainstream thanks to the relatively recent Walking with Dinosaurs 3D movie, which starred Pachyrhinosaurus. 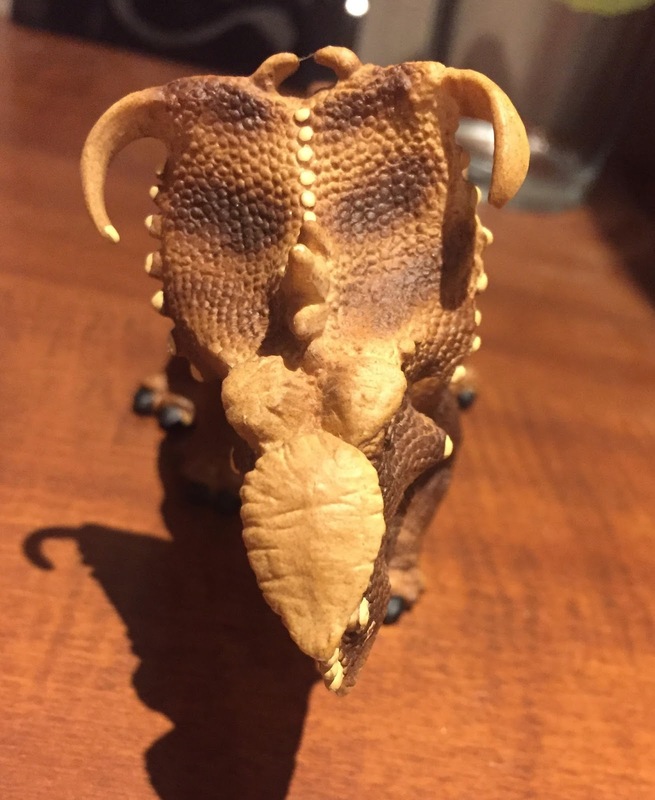 In fact, when I use Safari's Pachyrhinosaurus toy to help me teach visitors at the museum, many kids I teach instantly can identify it because of that movie! 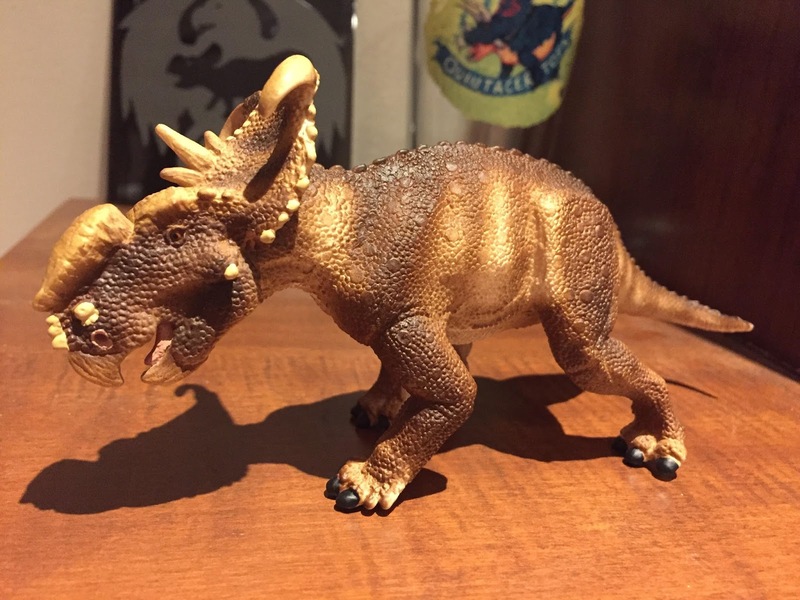 Wild Safari has gotten better and better over the years at sculpting their ceratopsians. Their Pachyrhinosaurus is definitely one of the best toys of this genus out there, which was originally released in 2014. 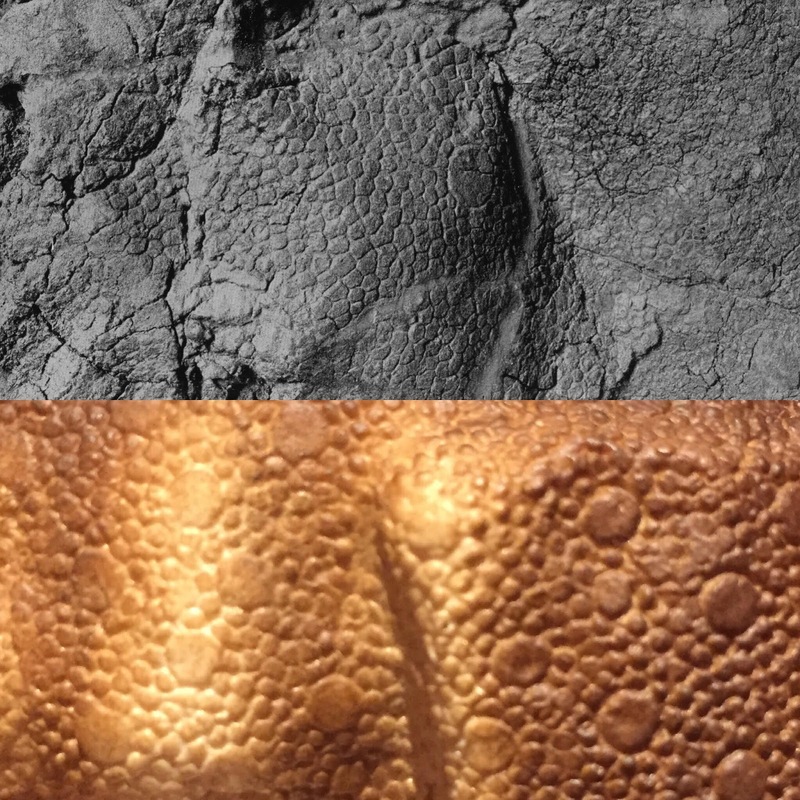 The top photo is of real fossilized Centrosaurus skin at the American Museum of Natural History. 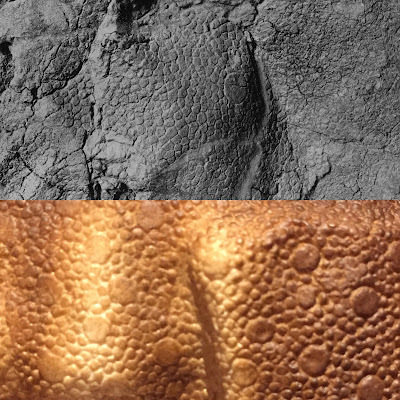 The bottom image is a close up of Safari ltd's Pachyrhinosaurus' skin texture. Homework was definitely done. Pachyrhinosaurus is probably best known for its unique head ornamentation. Unlike many other ceratopsians, which had horns on the nose and over the eye sockets, Pachyrhinosaurus had a wide mass of bone, called a boss, on its snout. This boss would have increased the surface area of the dinosaur's face and probably made a great tool for applying blunt force to whatever the dinosaur chose to ram into when alive. The frill of Pachyrhinosaurus, however, was adorned with horns, especially a pair of curved ones on the top. Safari's model also sports three small horns right in the middle of the shield part of the frill. These middle horns are only present in one species of this genus, Pachyrhinosaurus lakustai. The three horns right in the middle of this model's frill give it away as Pachyrhinosaursu lakustai, specifically. 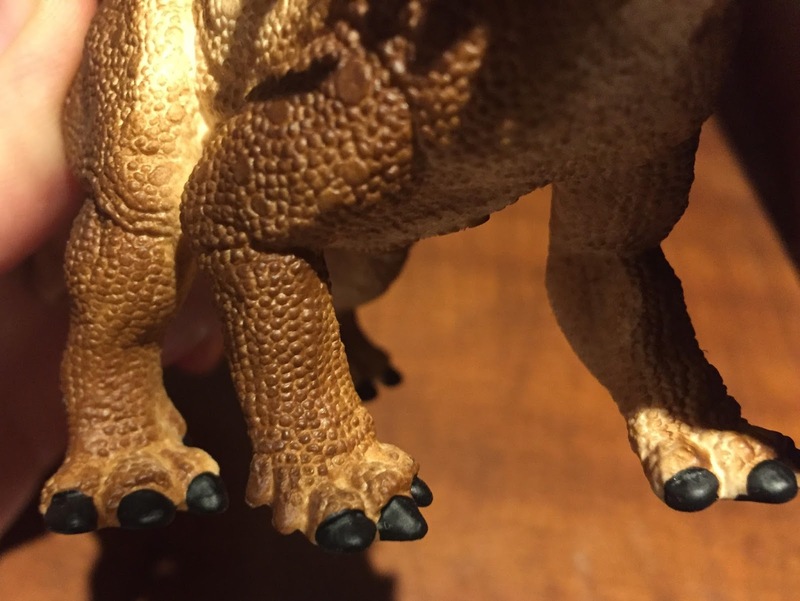 The other thing that Wild Safari has been getting right about its ceratopsians lately that many other toy companies still fall short on is the number of claws on the front limbs. Ceratopsians have five fingers on each hand, but only the first three of those fingers on each hand actually possessed claws. This model showcases that correctly. The angle at which the front limbs are positioned is also accurate, being slightly bent to the sides. Ceratopsians, like all known dinosaurs...and archosaurs in general actually, had claws on only the first three fingers of each hand. The one thing that I would complain about on this model would be its lack of bulk. Large ceratopsians, like Pachyrhinosaurus, were notably robust creatures with wide hips. Safari's model is too narrow when viewed from both front and side angles. Overall it gives the appearance of a much more gracile animal than it probably would have been in reality. That is all for this time! If you are interested in grabbing one of these awesome guys for yourself, they are sold at most educational toy stores, or visit Safari ltd's website here!